Dental materials and medicines possess high allergic potential. They provoke different allergic reactions in patients and staff. The sensibilization of the staff begins still in the dental school. There are several risk groups – the atopic individuals and these with other allergies. 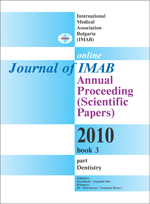 The aim of the study is to follow up the development and the connection between the allergic state and the professional etiology and to determine whether allergy is an obstacle for studying and practicing dental medicine. Key words: allergy, dental materials, students.